Thelma Mae Metzger, 84, of Wainwright, passed away in Union Hospital at Dover on Tuesday, August 21, 2018. Born in Wainwright on November 7, 1933, she was the daughter of the late John and Fanny J. (Davis) Swaldo. After graduating from Tuscarawas High School in 1951, she worked at the former Joy Manufacturing, where she met her future husband. On November 20, 1960, Thelma married Raymond G. Metzger, and continued her employment until she and Raymond were blessed with the birth of their two children, Roger and Rhonda. Then, she became a full-time homemaker. 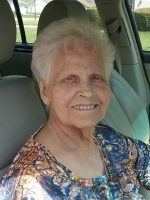 Thelma was a lifelong member of Sharon Moravian Church where she participated in the Women’s Fellowship. She also loved “hillbilly” music, especially Vince Gill. Her other interests included watching the Cleveland Indians and supporting her family. Thelma’s family includes her husband, Raymond of Wainwright; her children, Rhonda (Michael) Reed of New Philadelphia and Roger (Amy) Metzger of Dover; her grandchildren, Kayla Metzger and Calvin, Nolan, and Clara Reed; her siblings, Grace Swaldo of New Philadelphia and Fred (Donna) Swaldo of Uhrichsville; and her sister-in-law, Marilyn Swaldo of Dover. In addition to her parents, Thelma was preceded in passing by her siblings, John (Dorothy) Swaldo, Beatrice (Dan) Hutson, Gladys (Max) Schaar and Lloyd Swaldo. The Rev. Lloyd Gooden will officiate a funeral service for Thelma on Friday, August 24, 2018 beginning at 11 AM in the Linn-Hert-Geib Funeral Home & Crematory at New Philadelphia. Burial will immediately follow the service in Evergreen Burial Park at New Philadelphia. Friends are invited to the Geib Family Center following the committal service for fellowship and a luncheon with Thelma’s family.